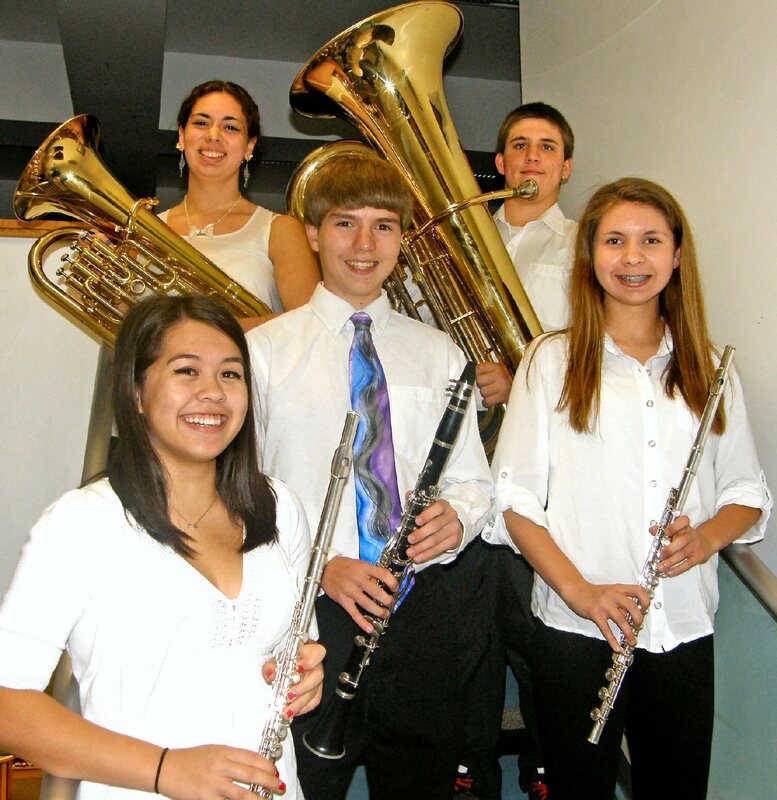 HANNIBAL, NY – Students from Hannibal High School participated in the New York State School Music Association Zone IV Area All-State festival at Oswego High School on November 13 and 14. Students were selected based upon past solo festival scores and were assigned to band, chorus or orchestra. From left are: (row 1) Sydney Waloven, Austin Baker, Vanessa Waldron. In row 2: Olivia Mann and Morgan Hare. Students through individual and group practice prepared music for the concert and then joined other musicians from Oneida, Herkimer and Oswego counties along with their guest conductor, to prepare for the concert performance. Donald Carducci, director of bands at Orchard Park High School, led the astute musicians that were selected for the band. A native of the Central New York area, Carducci received his Bachelor of Music Education Degree from SUNY Fredonia and a Masters of Music Education Degree from Ithaca College. He is recipient of the Excellence in Music Education Award for Instrumental Music given by the Buffalo Philharmonic Orchestra and the Erie County Music Educators’ Association. The program selected by Carducci included “Kwyijbo” by Daniel Montoya Jr., “A Festival Prelude” by Alfred Reed, “Royal Canadian Sketches” by Ralph Ford and “Canticle: All Creatures Of Our God and King” by Claude Smith. Audience members showed their appreciation for the musical talent displayed with much applause. The Hannibal School District is proud to have had Olivia Mann, Sydney Waloven, Morgan Hare, Austin Baker and Vanessa Waldron perform in the Area All-State Band.